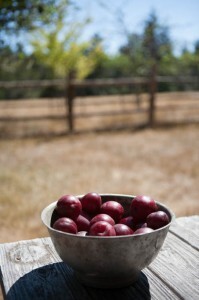 Last summer, I lived on a wonderful old farmstead which had many different fruit trees. 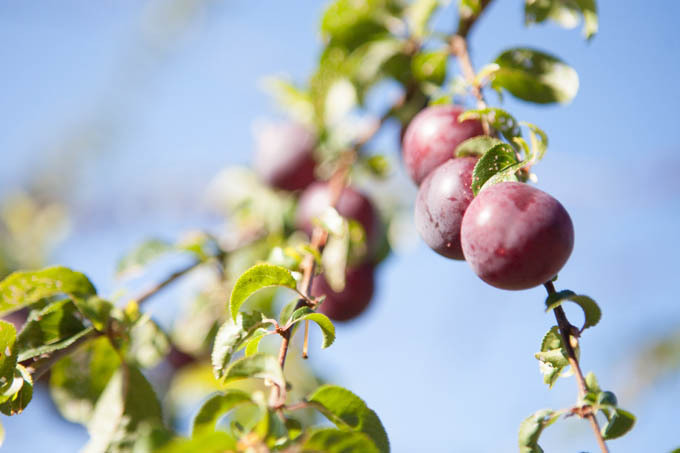 One of my greatest joys was gathering and eating fruits (plums, apples, pears, blackberries, cherries) and following the progression of blooms and bounties as the summer progressed. As masses of plums were suddenly ripe right outside my door, I made some preserves, but also decided to experiment with making some kombucha with the fresh plums. I included them directly in the primary stage of fermentation and then went off to the Farm to Fermentation Festival in Santa Rosa, CA expecting to return to a moldy failure. When I returned, I found a wonderfully healthy and tart beverage waiting for me. 1 Kombucha SCOBY – I recommend that if you only have one kombucha SCOBY that you peel it in half and use only one half of it. 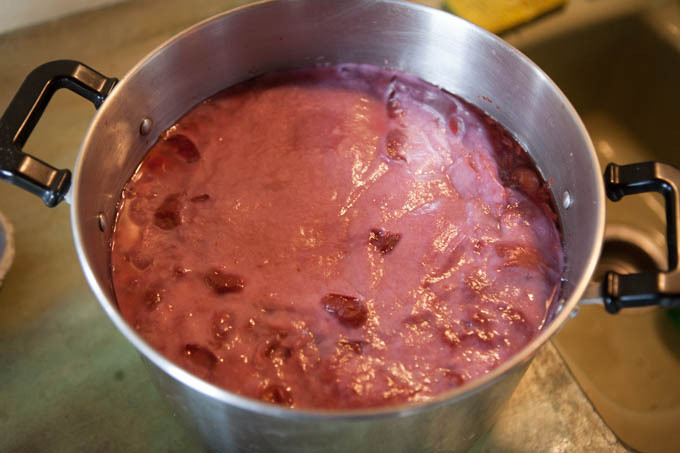 Some of the fruit mash on the surface will meld together with the SCOBY during the process of fermentation and you may very well not want to use it again for non-fruit-based kombucha. Lay the kombucha SCOBY on top. If it doesn’t fully cover the surface, don’t worry, a film of the expanding SCOBY will gradually cover the contents. Cover with a cloth to allow it to breathe some while keeping other dust and microbial invaders from settling in your batch. Let it sit for about 10 days, If the temperature of your fermentation space is warmer than 70 degrees or so, the fermentation may go more quickly. Cooler and it may take more time. The best way to tell if its done is to taste it. The longer it sits, the more tart/acidic and less sweet the taste will become. If it sits too long, it will become vinegary. Once it’s done, you’ll need to strain out the fruit mash, bottle it up and refrigerate it. I left a bottle out to see what would happen and it got super fizzy, but also started to become more alcoholic. Since some of the fruit was floating and exposed to the air as I began this batch, I feared that mold would grow on the surface, but I was very pleased to find that the surface fruit had become encapsulated by the growing SCOBY. The taste of this kombucha came out a little tart for my liking so I ended up adding a little additional sugar just to balance the flavor. 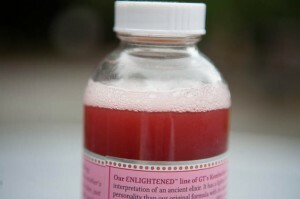 Of all the kombucha batches I’ve ever made (and trust me I’ve more than my fair share) this was by far my favorite. 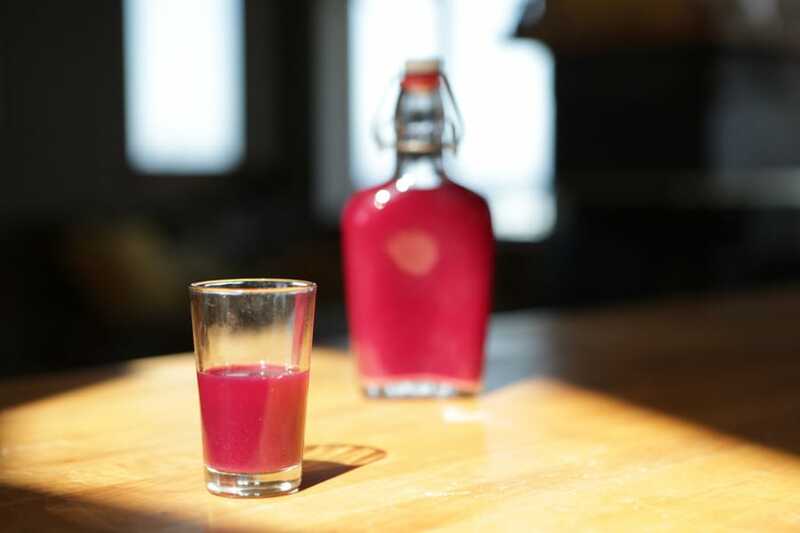 If any of you have experience making kombucha with fruit in a different manner or using different fruit, please comment and let us know what you’ve learned. Thanks and enjoy! This sounds like a wonderful recipe. I’m curious if you reuse scobies that were grown in a batch along with fruit or if you do something else with them when the batch is done. Brenda: I just chucked my fruit-melded SCOBY onto the compost pile and let a few billion bugs and microorganisms duke it out. Since this SCOBY already has some fruit in it, I’d consider taking smaller pieces of it and blending it in with other ingredients of a smoothie. Making kombucha jerky is another option and feeding it to your dog as a chew toy or nibbling on it yourself. 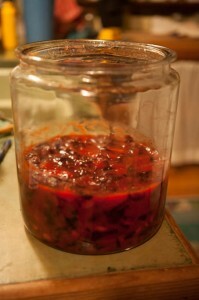 The folks at HolisticSquid.com have a nice recipe for making Kombucha Jerky. Where can I buy a Scoby in the Sebastopol area? Thank you! I’m not sure, Patty. I’d suggest putting a sign up at a local natural foods market. Shouldn’t be hard to find someone who would be happy to share. You could also just buy a fresh bottle of kombucha at the store and add it to your sweetened tea. A SCOBY should naturally begin to form on the surface within a few days, and will continue to thicken over time. I have put a punnet of strawberries and some extra sugar into a second fermentation. I left it for a few days in the big jar and then I bottled it. It was quite fizzy and utterly delicious in a few days. 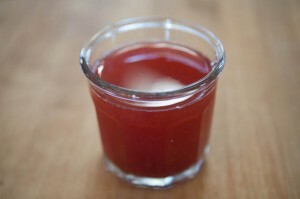 I left another lot for a bit too long and now have a strawberry flavoured vinegar for this Summer’s salads. Thanks Ros, good idea. I’ll try that with some strawberries from my farmer’s market! I usually skip adding fruit to the 1F because it can interfere with competing bacteria. I would think adding some plum to a second ferment or simply skipping the 2F and adding some freshly juiced plum would work better, wouldn’t it? Then you could refrigerate and skip the second ferment thus avoiding the creation of any additional alcohol but enhancing the flavour profile all the same.